This Victorian era residence is home to an adventurous client with an exquisite art collection. Enoki experimented with colour, textures, forms and massing to create a unique aesthetic. To accommodate the needs of this large family, functionality was paramount, with a specific use in mind for each room. The classic entry is an elegant backdrop to the contemporary lighting and furniture that have been placed within it. Leading off from the entry, the living room is as user friendly as it is inviting, with modular lounges to laze on and a relaxed bar table ripe for entertaining. Within the adjoining dining room the original pressed tin ceiling is a perfect backdrop to a statement American walnut dining table made by Gareth Brown. Completing the stage one renovation, the sitting room is classic in composition, yet bold and contemporary in styling. Enoki were engaged to convert a one room kitchen into an open plan kitchen/dining/living space. By removing one main wall, the rear of this residence was transformed, allowing light and views to flow through public living spaces. Preparation and cooking zones now work seamlessly together, with generous bench top space for prime entertaining. Enoki was employed for Stage One of this North Adelaide Residence, in conjunction with Butcher Brown Architects. The internal spaces are filled with warmth and an element of luxury, through the layering of materials, textures and an array of furniture and fittings. Enoki was engaged to design a number of custom items, including a solid Walnut desk with inlaid leather, beautifully crafted by Gareth Brown. Refined detail was key throughout the building works, producing a highly polished result. Lovers of timber and natural materials, the Parkside Residence features a study and two kid's bedrooms, in addition to the previously completed Moller library. These renovations aid the organisation and growth of the children through their teenage years. Within the study, the plywood joinery wall of shelving. 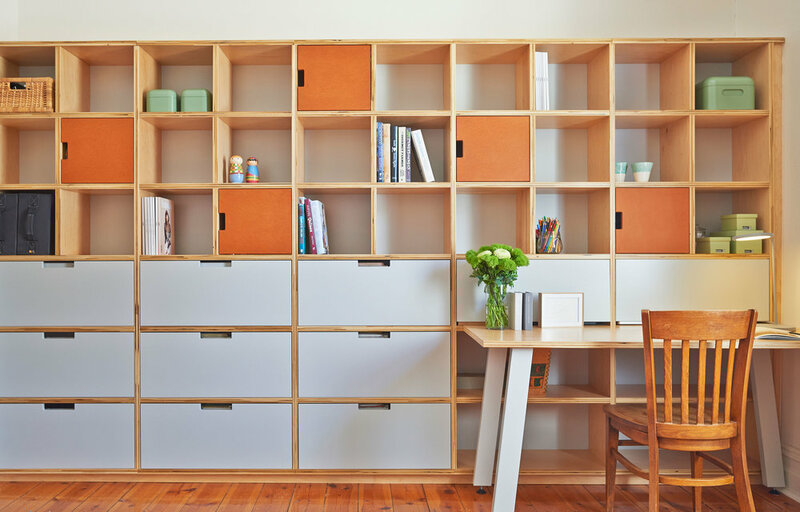 drawers and desk dominates the south-west wall, with pops of orange and soft grey. The daughter's bedroom features various shades of her favourite teal tone, cool and soft against the warmth of plywood. The compact space has been utilised to house a robe with high reading nook. Down the hallway is any young boys dream bedroom retreat, featuring a double loft bed with integrated desk and shelving. The backdrop of red brick wallpaper sets the mood, with a continuation of plywood robes set against industrial style furnishings. Down to earth clients with a love for nature and simplicity wanted to create a family home with room to breathe. Their brief asked for an earthy palette of woods and natural stones intercepted with crisp, cleans whites for simplicity and longevity. The Enoki Woof Stools make a feature at the readily used kitchen bench. As a long standing client, the Millswood Residence has gradually been refurnished room by room. The latest additions are the kid's breakout room and master bedroom. The kid's breakout room was turned into a haven for lounging within a space saturated with bright colours. The breakout room connects to the open plan living space, refurnished with Australian made and designed furniture and lighting. Walking through the hallway, this space features a domed pendant with a floral cast plaster and bespoke leather and solid walnut ottoman. 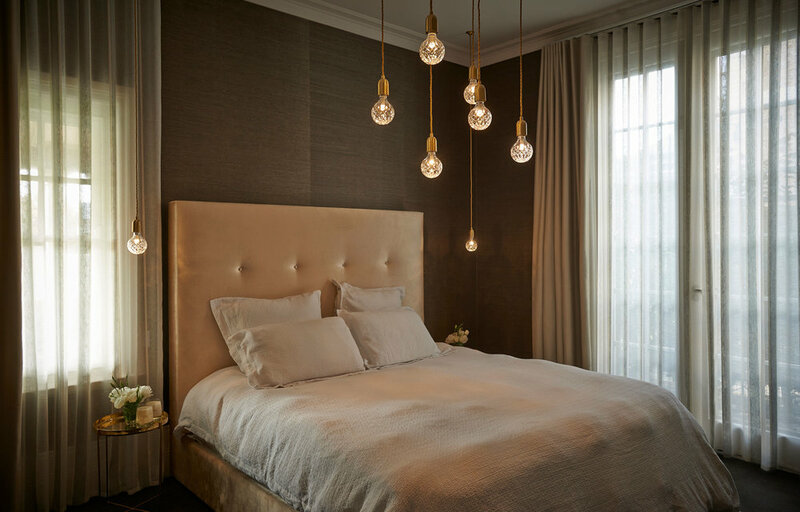 Within the master bedroom, soft neutral hues are paired against dark tones to create a warm and inviting environment. Integrating study and chill zones, the kid's bedrooms were given a total make over. Favourite colours are reflected in the choice of finishes and furnishings. Both spaces are home to custom beds, chest of drawers and study walls with integrated storage. The boy's bedroom is bold, bright and sophisticated. In contrast, the girl's bedroom is delicately layered with softy hues of blue. Working in close conjunction with the client and architect Chris Dimond, this new residential build is a home to grow with. Reflecting the client's homeland, the interior channels the simplicity and detailing of Scandinavian design. Warm timbers sit comfortably next to the crisp white interior, set to a backdrop of stone walls. Bold pops of colour were provided to the kitchen, making it a statement central hub which connects all living areas. Custom joinery elements feature throughout, assisting this young family with the organisation of everyday life. Linked only by a light filled corridor, the Kensington Park Residence extension and refurbishment, marries the old to the new. Continuity is provided to the two areas with a warm, subtle palette of grey, charcoal and a touch of blue. Earthy textures compliment these colours through the use of Spotted Gum flooring and elements of Birch timber veneer joinery. Asymmetrical components work together to create a balanced composition within the open plan dining, kitchen and living area. Up close, recessed handle detailing on the cabinetry fronts give a unique edge. The outdoor entertaining area is dominated by feature concrete tiles, which contrast with stainless steel. Within the kid's bedroom, Sixhands wallpaper creates a feminine backdrop, accompanied by a cluster of oversized bulb pendants. The client is loving their functional and comfortable home, filled with an understated elegance and loads of charm. The Kensington Park residence has been another successful collaboration between Enoki and the builder Urban Habitats. Completed at the end of 2013, the Prospect residence is about contrast, materiality and the unique. A large white brick extension, designed and built in conjunction with J&M Demetlica Constructions, connects to an existing gentleman's bungalow, extending this family home. The house was given a total refurbishment, retaining just a few details hinting to its era of origin. All the bedrooms were tailored to the loves of each inhabitant; from heavy velvet drapes with custom door hardware, to exposed painted brick work and a young adventurer's wallpaper dream. The wet areas are dominated by a variety of tiles, laid in custom patterns and paired with uniquely finished sanitary ware. To the rear of the house, the extension is the communal hub, where custom black steel glazing floods the space with natural light. Here, the open plan living connects the kitchen and the dining space seamlessly with the lounge and study zones. A walk in scullery/laundry is entered off the kitchen, completing a home that functions on both a highly aesthetic and practical level. As a growing family, this client required an extension to provide both a study and breakout zone for the kids. Not wanting to mimic the existing Georgian architecture, timber cladding and frameless glazing were used to create an understated box, which connects subtly to the existing dwelling. Polished concrete floors and the combination of stained and unstained oak was used for the linear built in joinery elements. This space connects to a chic sitting area within the existing residence, where a dark joinery wall creates a backdrop to iconic and bespoke loose furniture items. Fondly nicknamed 'the wall that could', this built in shelving is the hub of a young family home. 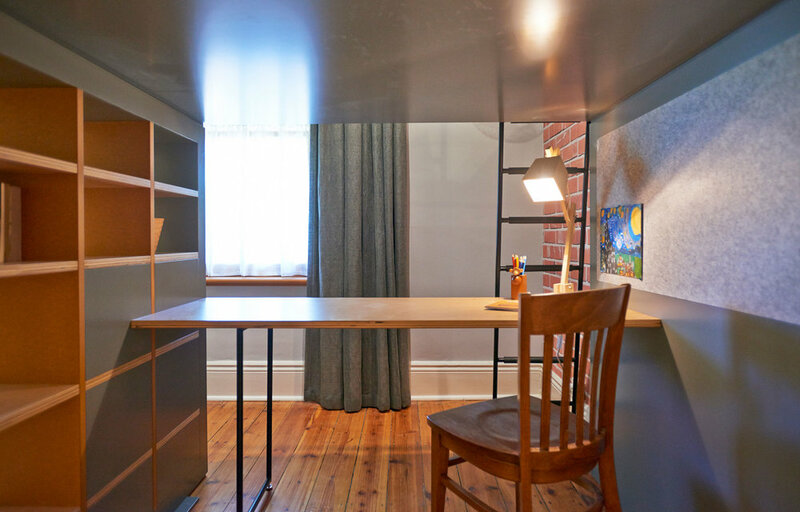 With multiple functions at the heart of its conception, the unit is utilised as a library, pin up board, study space, wine store, black board and display for loved items. Bamboo composite board creates the core structure supported by powder coated steel uprights and reclaimed timbers. A vintage library ladder provides an access feature that ties this much loved unit together. Enoki set out to create a unique yet functional family home within this new build. The interior is composed of sleek custom joinery accompanied with sophisticated furniture and lighting selections. The warm neutral palette is complemented by bold feature textures and finishes reflecting the client's style. The airy and light filled open kitchen, dining and living area is relaxed and crisp. A large custom lime-washed dining table made by Gareth Brown, sits upon polished concrete floors. Alluring feature pendants add an element of interest above the main areas of use. Rough stone tiles, hexagon mosaics and stone 'penny round' splashbacks break up the minimalist joinery. Wallpaper and decals are the main attraction in many of the rooms, providing strong character through the use of coloured graphics. Stage one in the renovation of this heritage listed residence included the refit of two highly personal spaces; a dressing room and boy's bedroom. The character of this residence lends itself to the brief outlined for each space; one retains the grandeur of existing details, whereas the other pushes the space into a highly contemporary realm. Rich in tone + texture, the dressing room is an opulent space, layered with intricately patterned pressed metal and embroidered linen curtains, as well as smokey mirror and dark painted ceiling. A bespoke ottoman sits amongst high end furnishings, creating a space of comfort. Concealed behind full height, sliding opaque glass doors, the custom robe integrates a dressing table and a variety of storage zones. Existing architectural features, such as the Carrera marble fireplace and timber work were retained. The redesign for the boy's bedroom reflects the transition from a youngster to adolescent. Blue geometric wallpaper dominates the space, complimented by three feature faceted pendant lamps. The integrated robe + desk joinery is detailed simply, finished in a dark timber veneer. Felted fabric is used throughout on the custom trundle bed and loose lounge seats, adding to the relaxed vibe of this room. This residential renovation reflects a love for natural materials and spaces which work practically, as well as aesthetically. The heart of the home, the kitchen, features complementary durable materials for a family who cook and entertain on a regular basis. The pantry acts as the organisational hub, concealed behind full height bi-fold doors, providing additional bench and storage space. Low level slot windows break up the main wall above the seamless stainless steel bench, whilst the panelled bulkhead above marks out the kitchen's perimeter. The St. Georges residence has encompassed remodels and extensions to various areas of the home including kitchen, dining and games room. Our brief for the kitchen was to modernise the area, create space, increase storage and form a greater visual link to the exterior spaces. Textural blonde timber gives the space a soft, contemporary feel and a strong 'coffee' coloured splash back delineates the space. A punch of colour was added to the island bench front, further set off by the Calcutta Gold benchtops. An external courtyard was enclosed to create an all season dining room with the feeling of sitting outdoors. The large expanses of glass and the raked ceiling allow a direct connection to the exterior, letting the garden into the dining space. The Florida 12 pendant features in the room, floating above the beautiful, hand crafted Oak table and sideboard by Gareth Brown. The existing internal fireplace has been opened to both sides and clad in a warm, natural stone to connect the existing with the new. The renovation of the games room resulted in a sophisticated yet playful adult space. The dramatic geometric wallpaper defines the wall space above the existing wall panelling. The black Florinda Pendant is an elegant solution to a pool table light and a custom made Agostino Brown dry bar sits with modern classic stools, while recovered vintage chairs scatter the room. The Heading kitchen is full of contemporary quirks intertwined with traditional detailing. The wall and ceiling panelling was given a slathering of white paint, brightening the space and pulling out existing features such as the timber window frames and beams. The black and white colour palette is complemented with a spark of mint green, subtly interjected with tile grout, power point backing plates and furniture. American Oak adds warmth, whilst the robust nature of Carrera marble provides a classic yet solid work top. Custom timber shelves were detailed right down to 'v' grooves for crockery display and black metal fixtures. And a custom storage unit stands strong as a main feature of this delightful space. Working in conjunction with architect Mark Reu and builders Urban Habitats, Enoki was engaged to transform the existing Federation home to accommodate a growing family. The existing residence was given a face lift, with new wet areas and custom joinery units. A seamless full height sliding cavity door separates the existing + new spaces, marking the connection between old and new. The new includes a substantial red brick extension, with a new zinc clad second storey; providing a variety of open plan living spaces and tight nit sleeping quarters. The ground floor living space features warm textured tones of red brick, butter coloured concrete tiles and a large timber panelled entertainment unit with fireplace. When required the living space merges with the outdoor entertainment decking via. sliding doors. Upstairs is dedicated to the children, with private bedrooms, bathroom and a functional living space.